In the Spring of 1989, my partner Jerry Burchfield and I, with the help of scores of dedicated supporters, undertook the erection of the largest photographic mural ever made. It was called The Tell. The public premise for the project was to celebrate Orange County’s 100th year and the 150th anniversary of the Discovery of Photography. Under the official guise of honoring the coincidence of these events, we invited local residents to send us mementoes of their family history in photographs. In reality, the underlying goal was to create a rallying point for the defense of Laguna Canyon against the powerful forces that planned to urbanize the land. The name “Tell” came from the archeological term for a mound of artifacts; the evidence of prior civilizations, buried over in time by natural elements. Rather than unearthing artifacts, we were building a small mountain composed of thousands of photographs reflective of the lives of the people who responded to our call for images. This “future fossil” ultimately grew to 636 feet in length. At its apex, it towered 36 feet high, dwindling down to ground level, as it undulated across the landscape and dove back into the hill. female figure clearly evident in its shape, and had a stylized Easter Island head as its physical and philosophical foundation. Over 100,000 photographs glued onto the wooden framework were woven together like pixels in a pointillist painting. 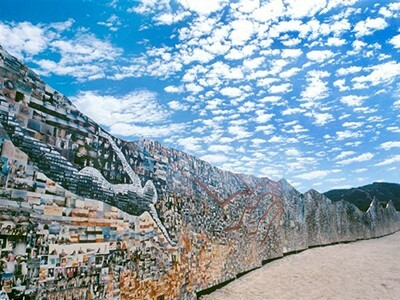 Sorted by density, color, content, and type of material, they were carefully interlaced together to create other symbols telling numerous stories of man and the land. These symbols, in turn, were positioned by story line on the chakra points of the larger body of the mural. 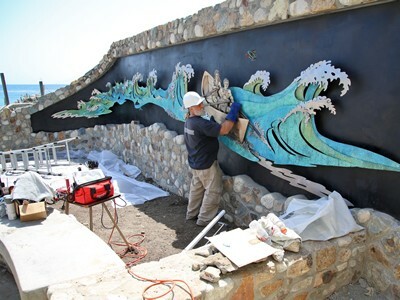 Strategically, the mural was located at the crossroads of Southern California’s first proposed toll road and across the two lane Canyon Road from the intended site of the Irvine Company’s newest master planned community. Both were slated for construction that year. Our ambition was to attract enough people to the canyon to give a voice to the many citizens who did not want to see this beautiful area paved over in the name of contemporary progress. This interactive art piece not only allowed, but required, the creative participation of great numbers of people. The plan worked …and they came. Over the many months of construction, our small army of helpers grew to hundreds, and ultimately thousands, as enthusiastic supporters brought their friends to help in its creation. And the people who had sent us photographs came to see what we had done with the histories of their lives. 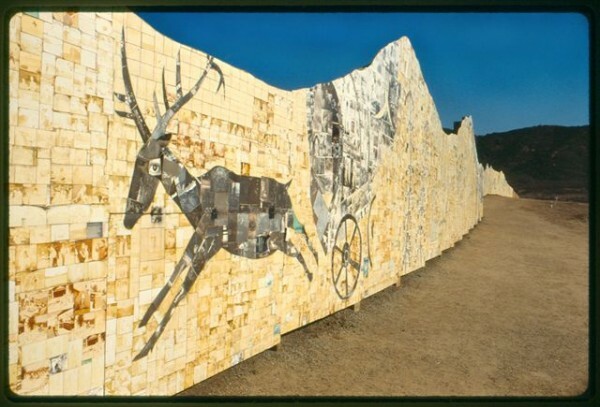 Once they turned off the busy Laguna Canyon road into the sanctuary of the still peaceful valley, they found themselves portrayed as an important part of a story that addressed critical issues of our time. Most of those who took the time to appreciate the complexity and raw energy of the mural inevitably asked how they could help. An important kinetic characteristic of the project was provided by the transient nature of the photographs themselves —they fade in harsh environments. Having previously field-tested the aging processes, we found that the most commonly printed photos we were likely to receive would change into a sepia color that resembled the sandstone bluffs of the surrounding landscape. By carefully patterning longer-lasting prints among those we knew would change, we were able to secretly embed a larger message with symbolic figures that slowly emerged from the mural as the sun beat down on it. For visitors who came in the early spring days, they were rewarded with vibrant, colorful images of themselves and their family and friends as part of the piece. Later visitors saw their stories fade to become a part of the background fabric of a larger story of man’s relationship with our world. 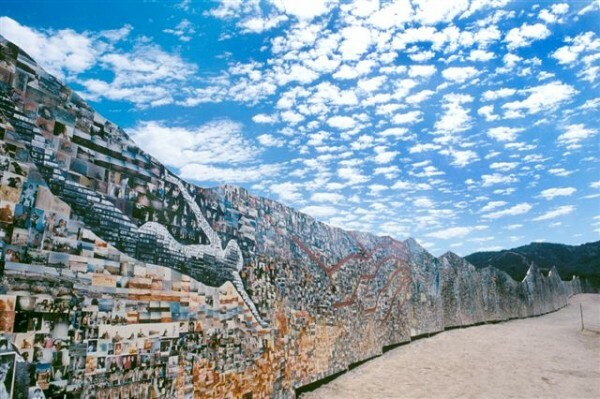 The most lasting impression of The Tell would become the large figure at the end closest to the road which was, by itself, composed of hundreds of individual photographs. Just as this composite figure was struggling to upright the toppled head of the reclining lady of the canyon, we were struggling to recount the tragic message of Easter Island and how a civilization collapsed because they deforested their homeland. We owe tremendous gratitude to the thousands of people who responded to the call for help, and hope you continue to take pride in what we accomplished together. Thank you … and please stay involved. The need to live wisely on the land is greater today than ever. the area today is a key part of the now publicly owned Laguna Wilderness Park. When the Tell was dismantled, we coded and stored most of it, hoping to eventually install it in a museum environment – but, since it had become so politically charged, no local venue (which largely relies on the financial support of major corporations) would assist in its preservation. 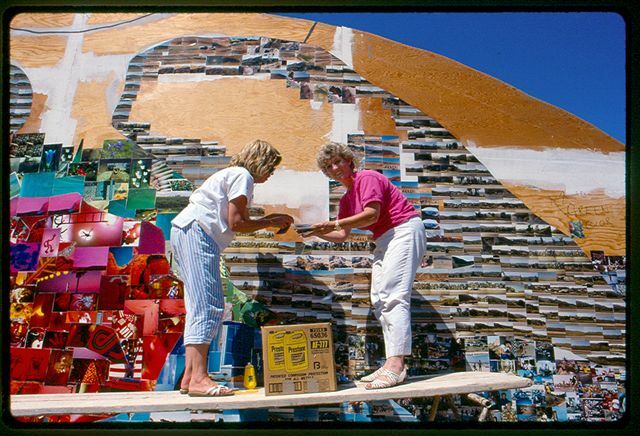 Except for the few pieces which survive in private collections, most of the mural burned in the Laguna Beach fire of 1993. Unlike an actual tell, the structure itself was carefully removed to leave little evidence on the land. All that remains are 88 barely visible post holes filled with pea gravel rhythmically spaced on the hillside for future arteologists to discover. Jerry and I are continuing to document our “last nine miles” and are currently on Phase XVI of the Laguna Canyon Project. It has taken many interesting twists and turns throughout its now 25 year history.